Recently Dubai witnessed the launch of its favorite sedan, a sedan that has become the definition for reliability, affordability and familiarity. Yes, we are talking about the all-new 8th generation 2018 Toyota Camry and this time Al Futtaim Automotive, UAE’s sole Toyota distributor, brings back the Camry Grande with a 3.5L V6 boasting 298Hp. The new Camry has been developed from scratch using Toyota New Global Architecture which is the basis for the all-new platform, units, electronics, and other core components, which results in a more striking design, a more dynamic driving and a premium ride performance. With over 19 million in worldwide sales and Dubai’s taxis, most of which clock almost a million kilometers, it is no secret that the Camry is Mr. Dependable. It’s you most reliable friend out there. We have talked to many past owners in the past and they have all agreed, that with the Camry all you need to do is change the oil and the oil filter during the periodic service and forget about it. The re-sale value is also quite high and the most interesting part is when it comes to selling it off, I’m sure a new sale post on dubizzle would garner a sale within the day. Such is the demand for the Camry. 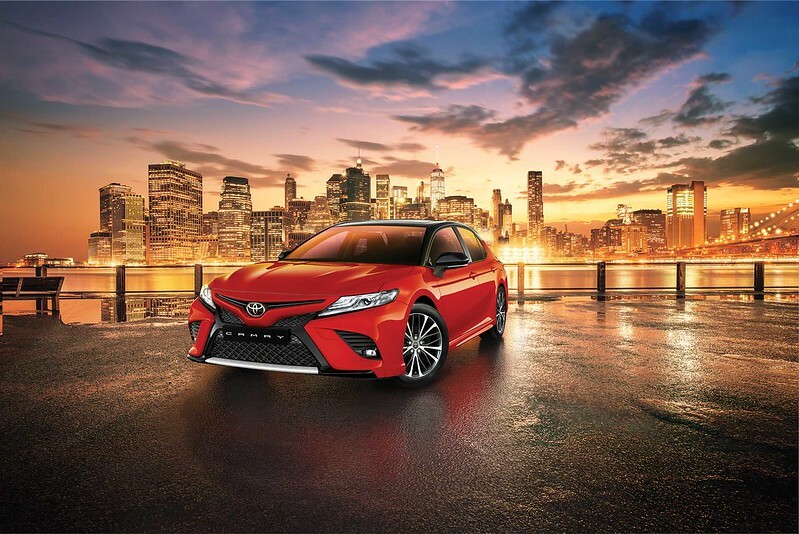 “Camry is a staple model in the Toyota family and one that has proven documented success over the years with over 9 million cars sold in 2017. Since its introduction to the UAE 3 decades ago, it has become a national landmark, and an intrinsic part of every day travel. This abundant presence on the streets of the UAE didn’t come only as a result of the hard efforts of our teams. The true genetics of the car is what makes is so popular, especially when it comes to its class-leading fuel efficiency, high resale value and low total cost of ownership” said Saud Abbasi, Managing Director of Al-Futtaim Toyota. The Grande’s 3.5L V6 engine is mated to an 8-speed automatic transmission, and delivers an outstanding 298hp, at almost the same fuel consumption rate of the smaller 2.5L engine thanks to the D-4S fuel injection system. Grande is available with three different grades, SE+, Limited and Sport. The vehicle gets a 7inch multi information display, 8inch navigation screen, paddle shifters and red interior for the sport variant, as well as 18inch alloy wheel. For those who prefer a smaller engine, Camry also comes with a 2.5-liter four-cylinder engine that produces 178hp, mated with a six-speed automatic transmission, packaged in two grades, the Camry S and SE. The 2018 Camry follows a much sportier look when compared to its predecessors. The car’s new fascia is accentuated by a two-piece grille comprising flowing thin and thick treatments, producing a stance that is undoubtedly more aggressive than any of the previous generations. Without compromising on the interior space, the 2018 Camry has a sleeker profile with a lower overall height by approximately one inch compared to the current model, creating a posture akin to that of a premium sports sedan. The designers pursued a wind-cutting shape and improved the car’s aerodynamics. Striking character lines around and along the body augment the aggressive front and rear fenders, giving the reimagined Camry a sportiness that it has never had. 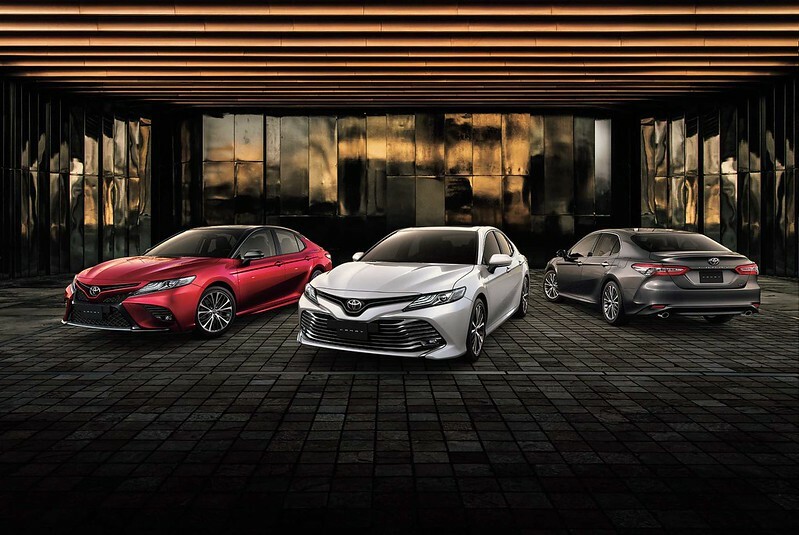 Camry Grande variants wear a noticeably different body style than the 2.5L grades, highlighted by a sculpted rocker panel, new 18-inch black machined-finish alloy wheels, and a powerfully expressive gloss black mesh grille. A subtle rear spoiler lip and a unique rear bumper with distinctive corner lines and smoke-tinted rear combination lamps highlight the changes at the rear. The completely redesigned interior is a fusion of functionality, futuristic styling, and a high degree of personal space and craftsmanship. A key visual element of this driver-focused design concept is an extensive yet elegant new character line that flows down from the instrument cluster and bisects the center console waterfall. All surfaces throughout the cabin—dashboard, instrument panel, center console, door trim, etc.—employ the highest grade of soft touch and premium materials. A six-way power adjustable driver seat and a four-way power adjustable front passenger seat are part of wide-ranging interior features of the all-new Camry. The new front seats have improved ergonomics, providing maximum comfort with a newfound level of ease and engagement to match the Camry’s elevated performance and athleticism. Similarly, the rear-seat accommodations are more refined than ever too, with improved passenger comfort. Moreover, the 60/40 split and reclining rear seats offer generous storage space. The all-new Camry features Toyota’s latest in-vehicle information technology whose next-generation displays offer a unique level of integrated information with minimal distraction. It relays information through two available interlinked displays; a seven-inch multi-information display within the instrument cluster, and an eight-inch audio/navigation control panel that is seamlessly integrated into the center console in a modern, flush-surface design. 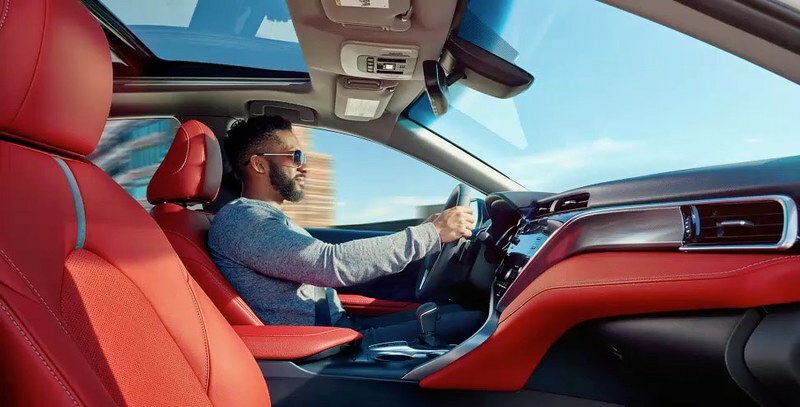 In addition, Toyota engineers have decked out the all-new Camry with a Qi-standard wireless charger in the front console tray to allow riders to recharge their smartphones and other portable devices on-the-go without wires and docks, providing a high level of convenience. Adding to the class-leading comfort and utility quotient of the 2018 Camry is the availability of a six-speaker sound system, which offers reliable audio performance. A high performance yet compact air conditioning that delivers top-class cooling and comfort while being environmentally friendly has been adopted. Additionally, the AC is equipped with a new air filters that can deodorize the air in the cabin and remove pollen and dust particles to extend a refreshing experience for every drive. The interior comes in a total of four color schemes and four unique ornamentation patterns; two wood and two metallic. It is immediately apparent that the all-new Camry is a different breed from past models just by looking at it, but the real revelation comes from behind the steering wheel. On the open highway, the 2018 Camry retains its character as one of the smoothest and quietest sedans in its segment. Despite its smoother ride character, the new Camry’s handling has been dramatically enhanced. The suspension system has been completely redesigned, with the front unit now consisting of an improved version of the previous generations MacPherson strut setup, while the rear receives a double wishbone system that provides a high sense of control and instills driver confidence. With a lower center of gravity, the Camry enjoys a better overall performance, as the vehicle load is evenly distributed among the four tires during acceleration, braking, and cornering. As with any other Toyota model, safety remains a top priority for the all-new Camry, which includes a comprehensive array of safety features to protect its occupants, such as six SRS airbags, Vehicle Stability Control (VSC), Anti-lock Braking System (ABS), Electronic Brake Force Distribution (EBD), Brake Assist (BA), Hill-start Assist Control (HAC), and an enhanced body structure and platform structure with a 30-percent increase in torsional rigidity, among many others. Similarly, there is a suite of convenience equipment that includes Rear View Monitor with Guide Lines, a Parking Assist System (PAS) that alerts the driver when approaching obstacles in blind spots behind, and a Front and Back Sonar System that uses ultrasonic sensors to detect obstacles and informs the driver of the distance between the sensor and an obstacle and the location of the obstacle with a buzzer and on the meter itself. 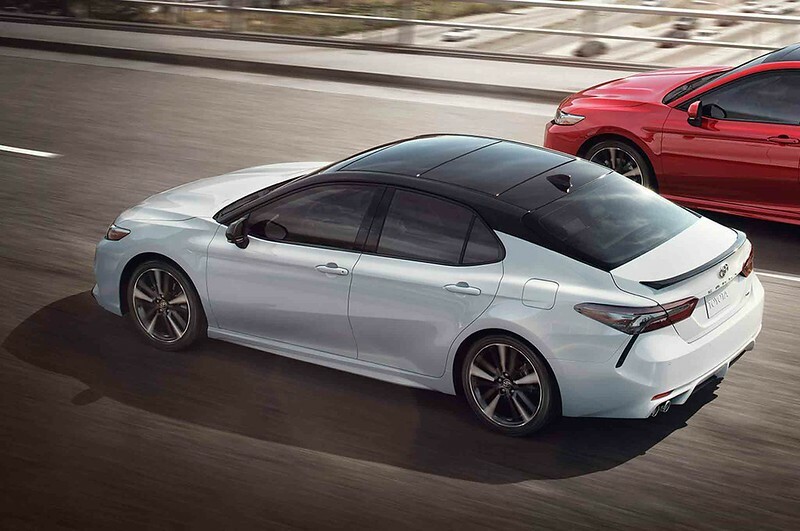 Available in nine distinctive exterior colors of which two have been newly-developed, including Graphite ME, and Platinum White Pearl MC, the 2018 Camry lets customers express their individuality. The 2.5L 2018 Toyota Camry starts at AED 91,000 for the entry-level S model and AED 99,900 for the SE. As for the 3.5L V6 Camry Grande, it is available in three grades, the SE+, Sport and Limited for AED 114,000, AED 122, 500 and AED 124,500 respectively.